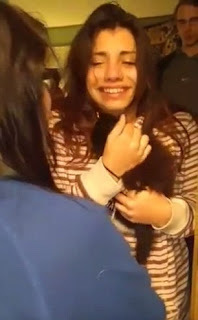 A woman brought her best friend to tears by surprising her with a kitten after her pet cat died. 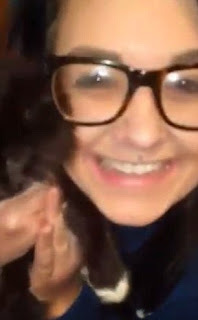 In a video posted to YouTube on Friday, one woman clutched an adorable, black kitten, and greeted her friend at the door. 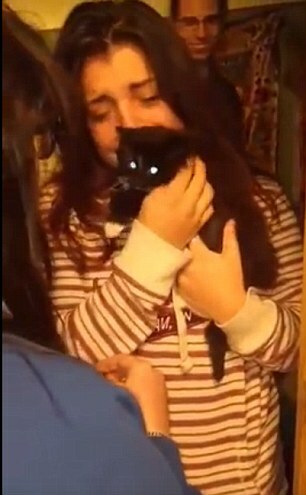 The friend was left with her mouth hanging open in shock before she hugged her friend, cuddled the kitten and burst into tears. A woman in glasses first posed with the kitten before the camera was trained on her best friend, who opened the door in a striped hoodie. 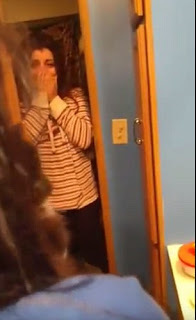 The shock registered on her face and she was rendered speechless as she covered her face. The two didn't even need to exchange any words for the surprise to sink in, and the two friends soon embraced as the kitten was handed over to its new owner. As the woman in the striped hoodie nuzzled her face in her new pet's fur, her friend said the kitten looked just like her previous cat. When she finally asked, 'Do you love him? ', the woman in the striped hoodie nodded and broke into a smile. It is unclear where the video was taken, but both women have American accents.